Cindy Green created our weekly LTC Insider Plus+ writing challenge for November 3, 2014. Here is what Cindy asked: What is one thing that Laura Thomas has done or said that inspired you? What did you do with that inspiration? Gee, that’s a hard question! Not. What has Laura Thomas ever done that wasn’t inspiring? Now, there’s a hard question for you. Laura has dedicated her entire life to you, to me, to every young writer out there and also some older ones as well. She has created a blog that inspires, provides opportunities and has some excellent advice as well. She has hosted conferences specifically for young writers, and those have helped me and all the other who attended greatly improve their writing in specific places. She has formed a haven for young writers, a spot where there are people just like you and me, people struggling to get their writing out there. Before I found this website, I truly had no idea how to write anything. I thought I was great, but there you go. I didn’t know how to get a first draft done, I didn’t know how to edit, I didn’t even know what a short story was! I followed Laura’s tips, I wrote a short story based on one of the prompts on her blog. I discovered how much I loved writing. I wrote some more, and a bit more, and a lot more. I entered one of my short stories to jaBlog! And guess what? It got published! Thank you, Laura Thomas, for this amazing opportunity you have provided to young writers around the world. I’m writing this challenge as a letter, to you. Your dedication is my main inspiration. To see how much you put into us young writers is really so amazing. You completely remodelled your successful business to accommodate junior authors and our dreams, and this is a gift I can only hope to repay by one day being published and citing you as my chief motivation and influence. Honestly, thank you so much. Your existence is my main source of inspiration, and it keeps me writing and submitting. I recommend you to every writer I know, and I hope to be utilizing your resources until age 21! Will the clock never end? I never write poetry, not if you don’t count the odd ridiculous rhyme. So as you can imagine I was very surprised at myself for writing that, and even more reluctant to share it with the group, especially since they were doubtlessly expecting that I had written something humorous and amusing, as that’s the only thing I usually share with them. But at their insistence I slowly read out the page. A brief silence fell. Regardless of the actual literary merits of that hurried bit of free verse, it certainly received an warm reception. I now intend to try reading and writing more poetry in the future, all because of a simple writing suggestion. And that for me, is the most inspiring thing about Laura Thomas and her work. Ever since I first heard about LTC through the story contest two years ago, writing has become a passion for me, a talent with real value that I enjoy developing. Thank you Laura, for the inspiration. My answer may be a common one, but one thing I was deeply inspired by was Laura’s enthusiasm and perseverance for helping young writers. I saw that Laura Thomas Communications was not just a commercial enterprise or a source of income, it was something that drew on a legacy of a person who had sought to write in her youth and had been unable to. To channel something like this into your life and make a career out of it – I think that is wonderful. She took her unfulfilled dream to fulfill hundreds of others. I used to thing young writers are not much good and do not require exposure since they are inexperienced, but Laura has changed my perspective in the six months I have been part of the LTC family. 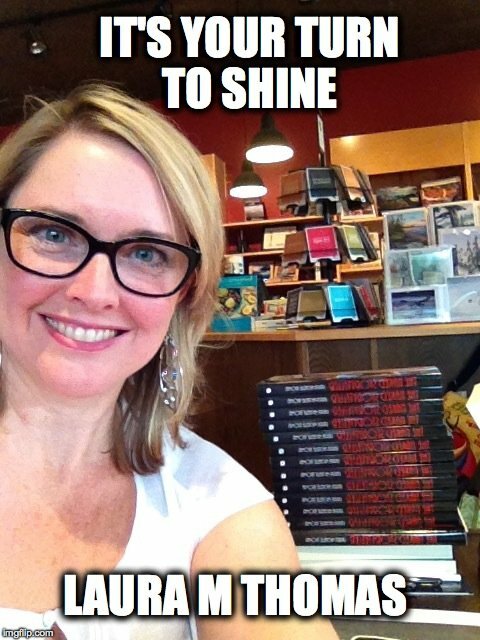 Laura has inspired me to motivate young writers, not to discourage them with criticism. I have begun to beta-read the works and poems of my friends and pen-pals and take their work in a more positive light than I used to. She has made me remember that we are still young; we are still learning. It is okay to not reach the mark sometimes, it is okay because we are still experimenting. I have also approached my English teacher with some ideas, and she is planning a workshop for Story-Writing in our school for middle school students. I agree! Thank you Laura!